The porcelain in the second half of the seventeenth century ordered by the Dutch from Deshima Island were copied from Chinese Wanli 'kraak' porcelain. 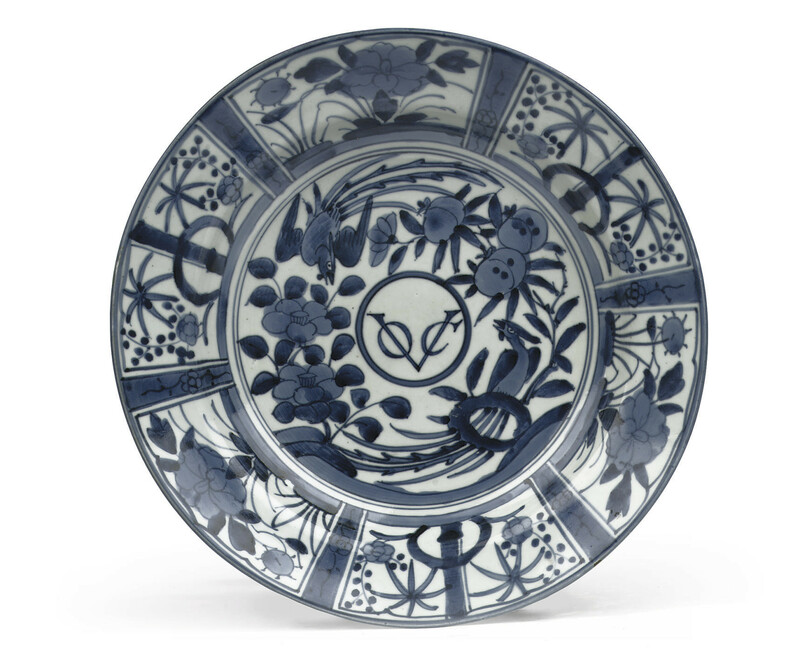 With the collapse of the Ming Dynasty in China in 1644 Holland's great source of supply of Wanli blue and white 'kraak porcelain' suddenly came to an end, and as a consequence the Dutch turned their attention to Japan. From about 1660 to 1700 a great variety of shapes and designs were exported to Batavia. The designs of the Japanese 'kraak' style dishes show some differences from the original Chinese prototypes. The wider panels without the use of auspicious symbols, and the depiction of the phoenix (ho-o birds) with their fanned-out tails, which again was later imitated in Europe on faience and porcelain. Dishes with the V.O.C. monogram are naturally exemplary of East West relations in ceramics and the role the company played in them. No special mention is made of them in the trade documents, but it can be taken that they were ordered for the use of the company staff at the factory on Deshima and possibly also in Batavia and other factories in Asia. For a similar example, see Porcelain for Palaces, The British Museum, 1990, p. 94, no. 32; David S. Howard, The Choice of the Private Trader, London, 1994, p. 39, no. 4; Ko-Imari Porcelain from the Collection of Oliver Impey, Barry Davies Oriental Art Ltd., London, 1997, p. 22. no. 4; and Maura Rinaldi, Kraak Porcelain, London, 1989, p. 226.